UPDATE (7/11/14): The replacement Lizard Skins bar tape was installed on 4/25/14 by a certified bike mechanic. Lizard Skins had sent an exact replacement as the product used in the initial review below. The result: after 600 miles the bar tape again started wearing down in the same spot. So, for me, the 1.8mm tape isn't very durable compared to other brands I've used. Especially disappointing considering the higher price of the Lizard Skins. Down the road I will consider trying the thicker Lizard Skin products. But I was told by the buyer for a bike store chain that I would probably experience the same issues with the thicker tape, as the top layer is essentially the same as the 1.8mm version, just with more padding underneath. UPDATE (10/21/13): Lizard Skins is sending a replacement tape for Xploritall to retest. They stated that the premature wear is likely due to stretching of the material during installation, although I did make a conscious effort not to stretch the tape. 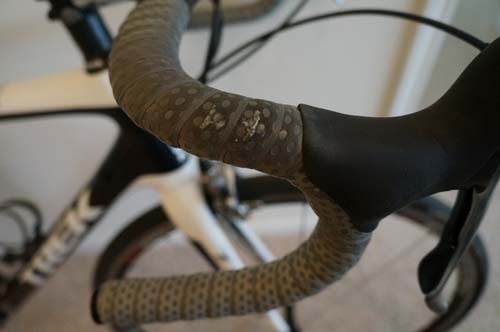 Lizard Skins also responded to the unraveling issue by recommending that the handlebars be cleaned with isopropyl alcohol prior to installation of the tape for better adhesion. We will be having a pro mechanic install the replacement tape, and we will post the results of the re-test here. 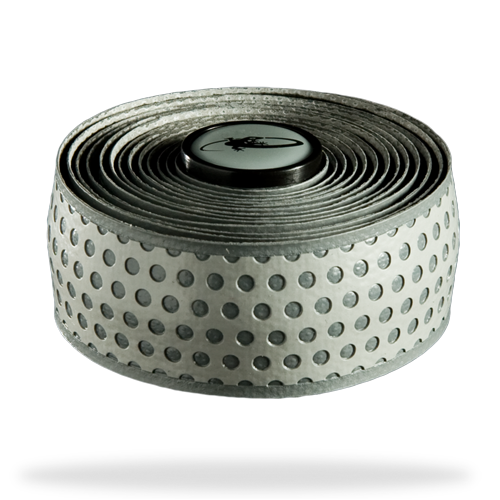 Handlebar tape is a bike accessory that usually boils down to personal preference to each rider. I am willing to bet that most people find a tape that works for them, and they stick to it. Maybe they will change colors just to shake things up, or if they have a new bike or color scheme they are going for. But for those still looking to find their go-to bar tape, the choices can be vague and the options many. The trial and error process can go on for a long time, as not many people will rip off and replace bar tape that is still functional, even if they know it is not "the one." There are variations between manufacturers and their brands as far as thickness and padding, material, and durability. After wearing through my last set of bar tape a little too quickly, I decided to find a new tape to try. I solicited my cycling friends for their advice. Almost unanimously, Lizard Skins was their answer. The cost is almost double the average tape on the market (ranging from $38-42), but the durability of the tape, they said, would make the tape last twice as long as other bar tapes. Lizard Skins are pretty pro looking as well. So, my decision was made to give these a shot. Lizard Skins come in a few different thickness options: 1.8mm, 2.5mm, and 3.2mm. Theoretically, the thicker the tape, the more padding/cushion you'd get. The texture of each is slightly different; the 1.8 model has a sort of dimpled texture with a shinier appearance, the 2.5 model has a miniature steel-stamped texture, and the 3.2 model has a woven appearance. Lizard Skin states on their website that the Vacansoleil-DCM professional team tested the 3.2mm model at the 2012 Paris-Roubaix and loved them. Paris-Roubaix is famous for it's many sections of bumpy cobblestone pavement that take a serious toll on bikes and riders with all of the bumpiness. Their website also claims the weight as 50 grams for 1.8 set, and 56 grams for the 2.5 set. Lizard Skins claims the 1.8mm tape is the lightest on the market. No weight is given for the 3.2. The colors options vary slightly between the 1.8mm and 3.2mm, but look much different in person due to the shinier material used for the 1.8mm. The 2.5mm version has more color choices, as well as a few dual-color options. I selected the 1.8mm version in grey, so the rest of this review is specifically for that model. The 1.8mm set comes with two rolls of tape, two finishing labels, two clamp covers, and two bar plugs. 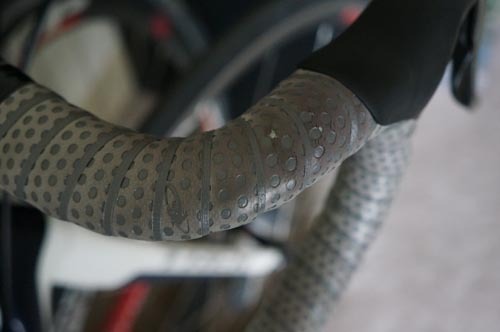 The tape length is 80 inches for each roll, enough to wrap any handlebar, Lizard Skins claims. The tape has a slightly adhesive strip to help keep it in place once installed. A cautionary sticker is placed on the tape warning not to stretch the tape when applying. As someone who installs their own bar tape, this had me a little worried. I typically have to rewrap my tape a second time with a slight bit of stretch in order to be able to finish with about 2-2 1/4" inches from the stem as I prefer. To compensate for not being able to stretch the tape due to the warning, I decided to allow less overlap between wraps. The first attempt still resulted in a shorter wrap job, with too much space remaining between the end of the tape and my stem. I do ride with somewhat wider handlebars, Zipp 44cm - which are typically wider than the same measurement in other brands of bars due to where the measurement is taken. However, I usually have enough tape if I stretch slightly while wrapping. I rewrapped the tape again, allowing even less overlap, and finished with an acceptable space between the tape and bars. The dimpled pattern of the 1.8mm tape gives a pretty visible indicator for how much overlap you're working with, which is nice. I loved the feel of the Lizard Skins. They provide a grippy, rubbery feel with a bit of squish. The cushion felt even softer than other tape brands with significantly thicker material. After only about 150 miles, the tape wraps separated, leaving a gap between wraps where the bar was exposed. This happened on both sides of the handle bars, forcing me to re-wrap the tape with more overlap than before. Of course, the gap between the stem increased as a result, leaving too much space. This is a problem for me as I like to use this portion of the bars frequently as a hand position. After 500 miles, the tape is now starting to break down and show the white material below the top surface layer. This is occuring at the top bend of the handle bars near the brake hood. As someone who typically gets about 1,500 miles out of bar tape, this is very disappointing. And nowhere near the durability that would justify paying twice the price of other bar tape options. Perhaps the wrapping issue would be lessened if installed by a pro (though I haven't had problems any problems with other tape), but the durability issue is a problem. Photo showing material starting to break down. Note that darkish discoloration due to new pair of gloves. I'd be willing to test out the thicker versions of the Lizard Skins tape to see if thicker material provides better durability. But I did like the look and feel of the 1.8mm until the material started breaking down.